My recipe for “Arroz con Pollo”, classic chicken and rice prepared Mexican style with lots of seasonings, ready in about 30 minutes. 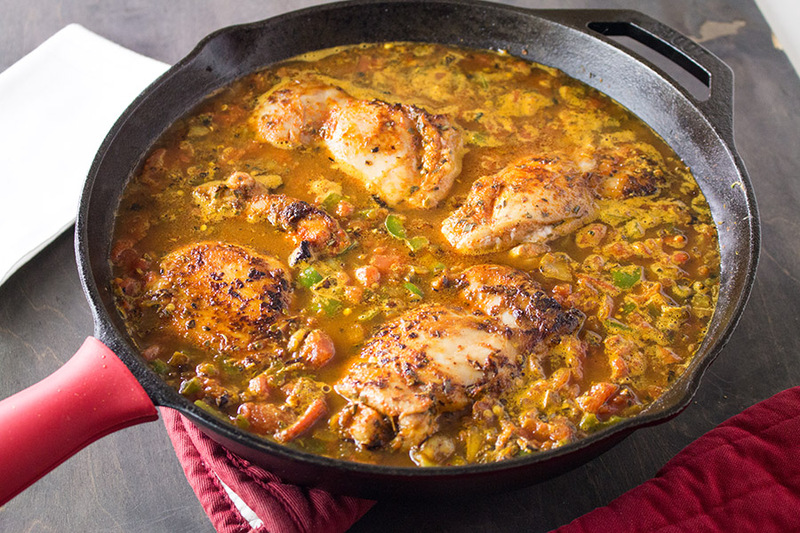 Arroz con Pollo, Spanish for “Rice with Chicken”, is a classic Latin comfort food dish. You’ll find versions of this dish all over the world with slightly different ingredients and methods, though the bases remain the same. It’s a classic pairing, really, two very basic ingredients that are abundant, easy to find, and popular with the masses. And honestly, they’re just SO. DARNED. GOOD. 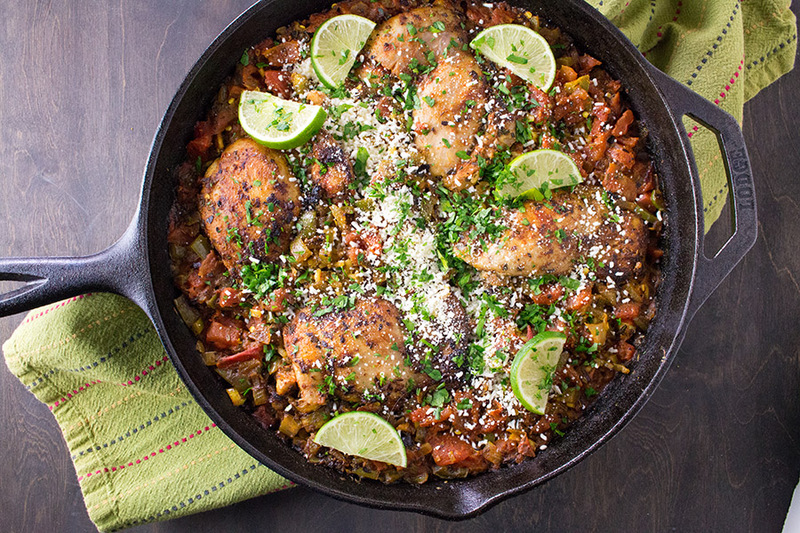 When done right, that is, and with this Arroz con Pollo recipe, regardless of which country’s style you’re going for, you’re pretty much guaranteed a satisfying meal. We’re moving in the MEXICAN direction with this recipe, going with more traditional Mexican seasonings, but we’re making it easy. Easy is good, right? Better than difficult! It isn’t a difficult dish to prepare anyway, but this particular recipe will have your meal on the table in well under an hour. Get those forks ready! Today we’re cooking with Hunt’s Tomatoes and fresh produce from Walmart. We bopped over to our local Walmart and picked up a can of Hunt’s Spicy Red Pepper Diced Tomatoes. There are quite a few Hunt’s Tomatoes to choose from, but we opted for the Spicy Red Pepper choice because, you know, we like it spicy. Super easy and stress free. I like that. I like to use the canned tomatoes because of the juiciness and how they break down so easily into the entire meal. I also snagged the needed fresh produce from the Walmart product section – onions, garlic, jalapenos (of course! ), cilantro, limes – that really make this recipe POP. 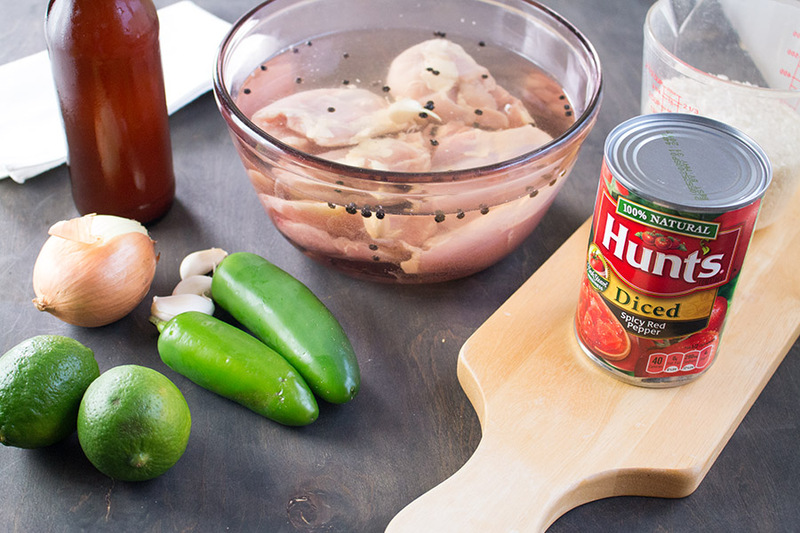 When you’re ready to get cooking, get all of your ingredients together. Be prepared! Here is a shot of MOST of the ingredients you’ll be using for this recipe, minus the seasonings and chicken stock, should you even need it. It isn’t a whole lot. See? Easy! Notice the chicken thighs in the glass bowl. It isn’t just water. That is called a “brine”, which is a salt water solution. 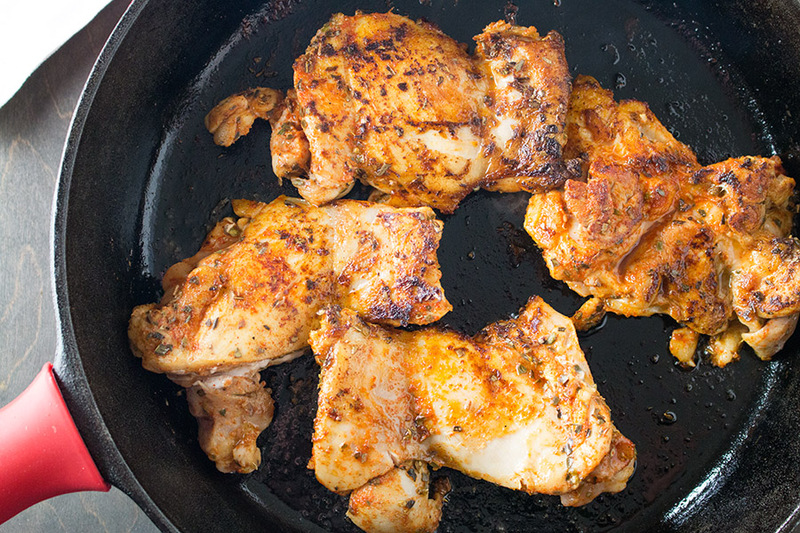 Brining is an effective way to bring additional flavor to meats, especially chicken. Brining helps seasons the meat, and also keeps the chicken moist as it cooks. A typical ratio is 1 cup kosher salt per gallon of water, but you can use less salt if you want. So, simple “kitchen hack” for this recipe: The day you want to prepare the meal, set your frozen chicken thighs into a brine, then cover it and leave it in the fridge that morning or afternoon. The thighs will be nicely seasoned and ready to go when you get home to get cooking. For this brine, I used salt but also tossed in a few peppercorns and a couple cloves of crushed garlic for additional flavor. I also want to mention a couple of ingredients I include that you may not have, but really SHOULD try to find. They are saffron and turmeric. 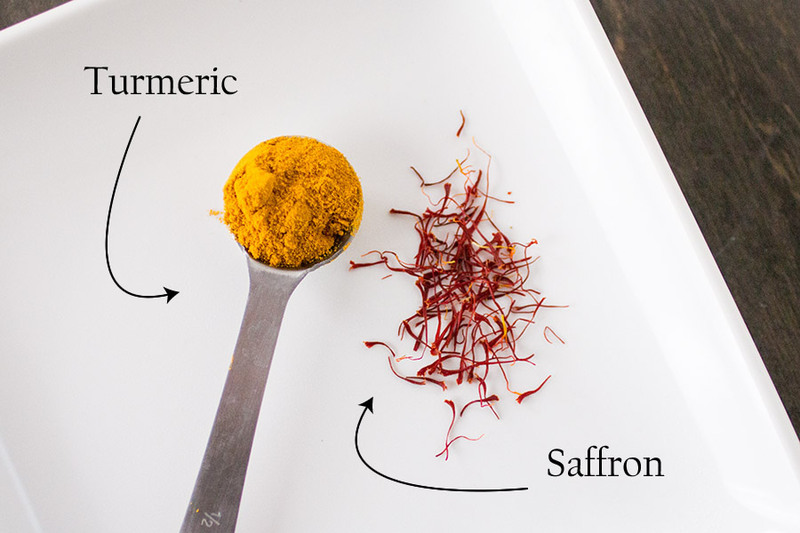 Saffron are tiny threads hand-picked from the crocus flower and they have a wildly unique earthy flavor. If you can’t find them, it isn’t a deal breaker. Use turmeric instead. It brings a milder earthy flavor, and its bright yellow hue will imbue the rice with vibrant color. I used both. 5 saffron threads optional, but recommended! First, you’ll want to season and sear the chicken thighs. Bone-in thighs are more traditional, but the boneless are GREAT so you don’t have to shred the meat after. Just heat the oil in the pan and sear them up. I like to use a lot of seasonings, but salt and pepper is fine, too. Set the chicken aside, then cook up your chopped fresh produce. I’ve used onion, jalapeno peppers and garlic here. You can use green bell peppers for a milder version. Red bell pepper will be milder and sweeter. I like the extra kick with jalapenos. add your seasonings and rice, beer or chicken stock, then season, add your chicken back in and cover. Reduce the heat to a simmer and wait. Seriously! It’s that easy. Here is what the dish looks like just before I started simmering. It only takes about 20-30 minutes, depending on how much rice you used. Check it with a fork. When the rice is tender, it’s done. If you think it’s too dry, add in a bit of chicken stock or water and simmer longer until it is absorbed and done to your liking. Then…SERVE IT UP! I topped ours with some freshly chopped cilantro, crumbled Cotija cheese and slices of lime and OH YEAH! Delicious. 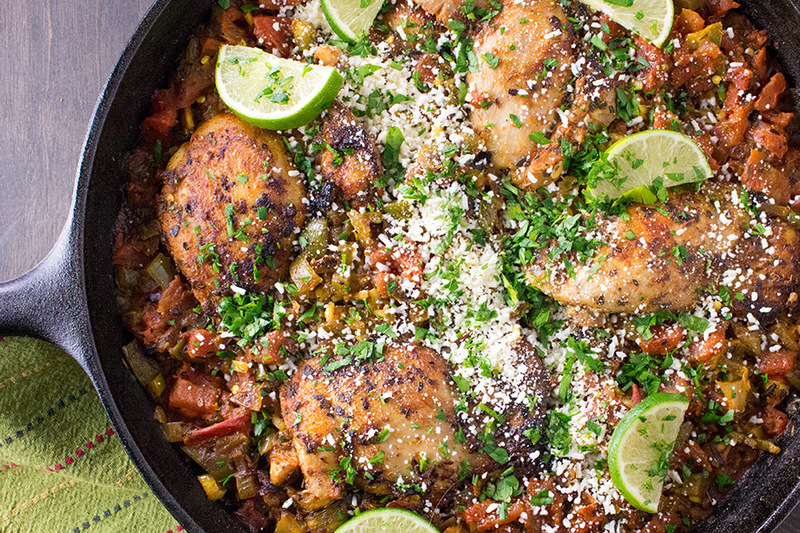 This is GREAT for a party or larger group, or for a big family for a Mexican dinner night. Or for leftovers! Such a wonderful, classic rice dish. 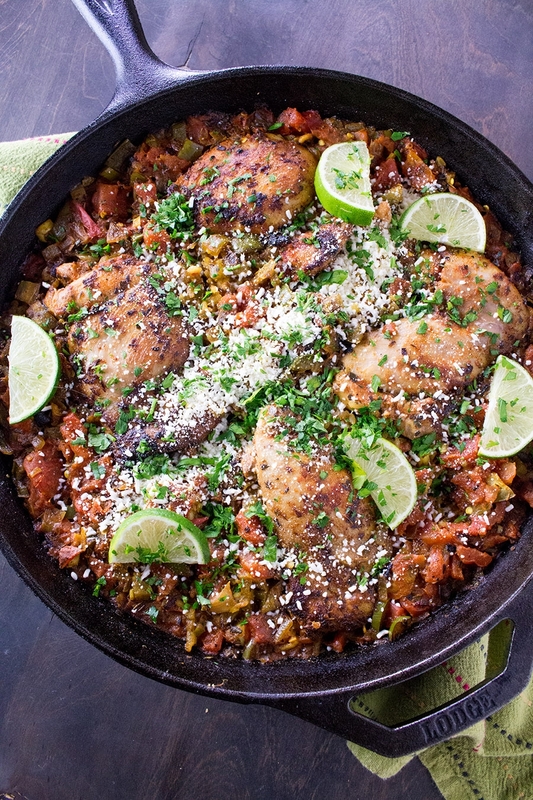 My recipe for "Arroz con Pollo, classic chicken and rice prepared Mexican style with lots of seasonings, ready in about 30 minutes. 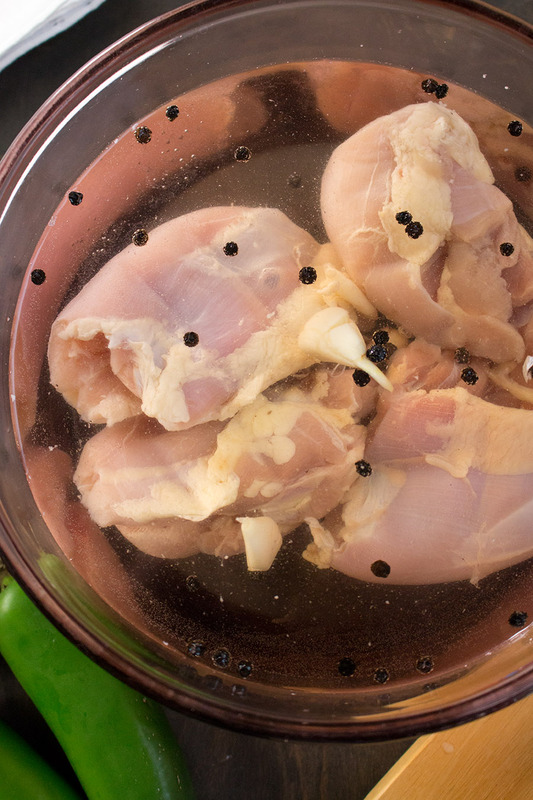 Brine your chicken thighs by placing them into a large bowl. Cover them with water and add 4 tablespoons salt, 2 garlic cloves crushed and 1 tablespoon black peppercorns. Cover and refrigerate at least 4 hours. Remove chicken and pat dry. Season with a bit of oregano, paprika, cayenne and garlic powder. Heat a large pan to medium heat and add olive oil. Add chicken thighs and cook a couple minutes per side. Remove and set aside. In the same pan, add chopped onion and jalapeno peppers. Cook about 5 minutes to soften. Add garlic and cook another minute, stirring a bit. Add remaining seasonings along with the rice and stir. Cook about a minute, stirring, to very lightly toast the rice. Add tomatoes, beer or broth, and reserved chicken thighs. Cover and reduce heat to low. Simmer, covered, for 20-30 minutes, until the rice has absorbed all of the liquid. If it seems too dry, add a bit more broth and simmer until it is absorbed and cooked to your liking. Remove from heat and top with sliced limes, Cotija cheese and chopped cilantro. To serve, squeeze a bit of fresh lime juice over the top and enjoy!